Let us know what you think after a day or so. I wont force it so it could be a week or more before I get it. I should know what to expect by then! 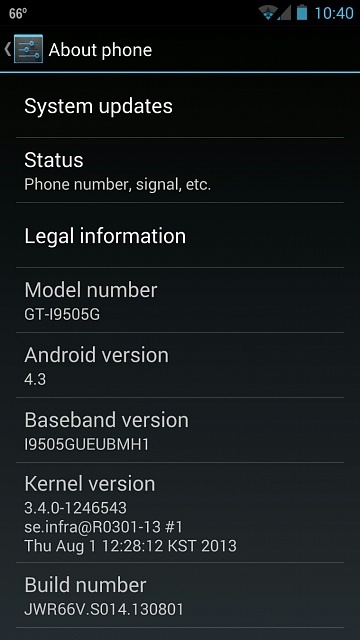 This process worked on the ONE GPE as well! Thanks! I can tell you now right off the back it feels a lot smoother. Dolphin Browser used to have stuttering when scrolling and especially when exiting. It was really bad and I thought it was an issue with the app itself but that didn't turn out to be the case. This was bugging the hell out of me. Just on this alone I can tell that 4.3 offers under the hood improvements. I'm also impressed how fast this update was released. If this is the case I'm completely sold on Google Play Edition phones. I used to be a Nexus only guy but I'm very pleased with my GS4! I thought this after I updated my Nexus 7 to 4.3. It seems much smoother like they threw some more butter in there! I have not spent much time with my Nexus 7, so I am not sure if the update borked anything. Appreciate the feedback and thoughts! This definitely does NOT work on my GE S4. Tried multiple times. I'm still on 4.2.2. In this 4.3 build for your GE devices does 4.3 fit the icons and widgets any better onto the home screen? It looked like in 4.2.2 that there were excessively large margins at the top and bottom of the screen below the persistent search bar and above the software navigation buttons. I tried many times as well, and did not receive the update. I then followed the steps above, but this time I unchecked the "show notifications" box. I went to check for a system update, and got the prompt that the 4.3 system update is available. It says that the update is available "via Wi-Fi only until August 4th". So make sure you're connected to a WiFi network when doing this. Hope it works for you. Good luck! Thanks. Tried it again this time unchecking the show notifications box. Still didn't work. Maybe it just takes several tries and it was a coincidence in your case that it worked exactly the one time you had that box unchecked. Update: it worked for me after I turned "Show notifications" back on! Go figure. Must be coincidental. I didn't watch the upgrade process after I clicked on the "reboot and update" button. When the phone booted back up I saw that I was still on 4.2.2 :-( I went through the steps again, and yes it does take many attempts before it'll work. When it rebooted into recovery to apply the update it appeared to get about half way through and then I received an error message. Not sure why it errored out. Could it be because I am rooted? Does this fix the camera issue? Where if you take a picture with the phone being up and down it automatically turns picture sideways? Rooted alone should be okay as long as you have stock recovery and have not removed apps via titanium backup. If you did any of that you will need to flash a stock 4.2.2 image to complete the update or restore from your backup. Worked for me. I had to do it twice and recheck show notifications. I'm about to install now. "Update for "Maps" could not be downloaded due to an error. (Error retrieving information from server. [RPC:S-5:AEC-0])"
Any idea how to fix this? I tried resetting all sorts of things, to no avail. Remove your google account and then re enter it and restart your phone. I assume you meant you could not update from the play store? That should work. Thanks for the info. I haven't removed any apps with Titanium Backup and AFAIK I have the stock recovery. I did flash a custom recovery on it before, but then flashed the stock 4.2.2 image back. Maybe something is wrong with the image I flashed? Is there an "official" 4.2.2 image available anywhere? *edit* On second thought, the "stock 4.2.2" image that I had flashed was not truly "stock". It was the only "stock" image I was able to find at the time I needed one. The image has the Browser removed(?) and was already rooted. Maybe that's the problem? I still can't find an "official stock" 4.2.2 image anywhere. Anyone know where I can find it? I'm glad to say that 4.3 fixed all of my Bluetooth issues! Yes, sometimes you get errors on the update if certain files are not present. Possibly XDA has the stock 4.2.2 image. My update just came through. Loaded with no problems and running smoothly. 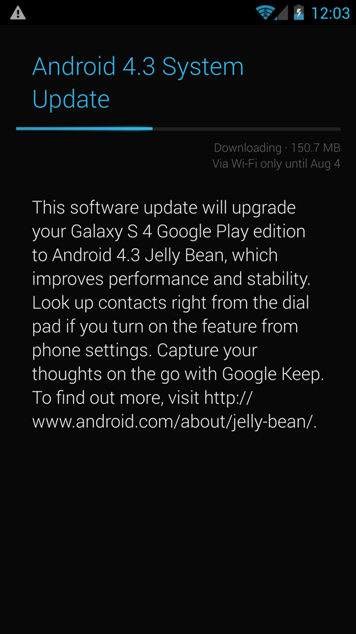 I have tried the above methods to update my gpe but still no update notice. Any ideas anyone? Have you been on wifi? If so, I would just keep trying daily as they roll the updates out in stages. I have waited up to 10 days for updates before on Nexus devices. yes, I am on wifi. 10 days really? sounds terribly slow. I will keep trying. Do you know if the update is just broadcast generally or by some regional method. Or is it that their server is just bogged down with requests for updates? Many say the updates roll out regionally but I have never tracked it. I usually do not force it but it may be delayed cause many do? Not sure. I doubt this will take that long since there are not that many GPe's out there. I have often received an update when starting my phone up in the morning(I turn it off every night). App that turns your phone into a controller? "Weve loaded up your new tablet with Pixar's La Luna..."
[SPRINT] How do I block future OTA updates?